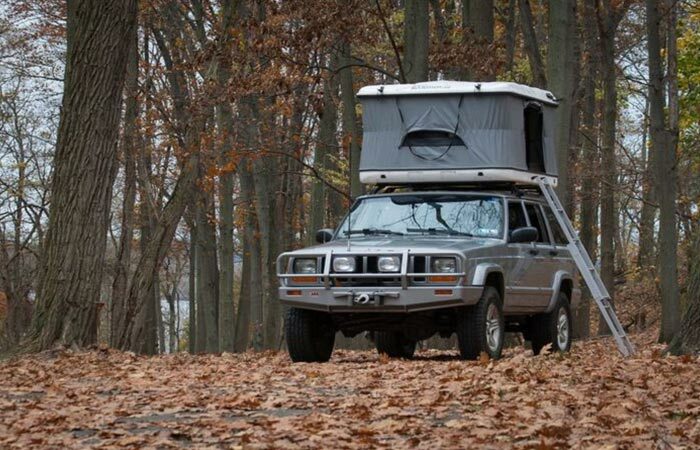 Do you want to be able to hop into your vehicle and head out on a camping adventure literally anywhere without having to worry about scouting designated camping spots? How about being able to sleep in your tent without the discomfort of being on the cold rocky ground? Or what would it feel like if you could eliminate the hastle of dealing with tent poles and pounding in stakes? If an alternative to the traditional camp tent is something you may be interested in, why not look at investing in a vehicle rooftop tent, also known as a RTT. Never worry again about bugs or critters crawling over the ground and into your sleeping quarters, or moisture from the surface chilling you during the night. 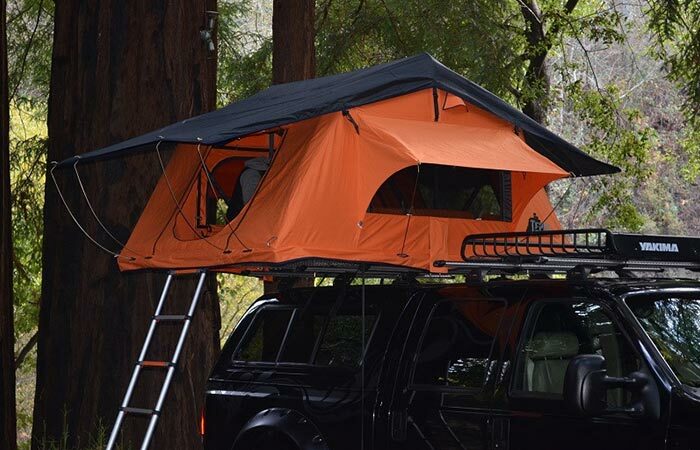 A vehicle rooftop tent is not only convenient to store but incredibly easy to set up. It will save you time and allow you to begin enjoying your camping outing quicker rather than having you spend hours setting up shelter. Let this act as an introduction to vehicle rooftop tents where we’ll share with you what makes a vehicle rooftop tent so great, go through the types of rooftop tents on the market, some things to keep in mind before buying, and provide you with a list of the best of the best in categories such as most innovative, best in versatility, and great for families. Why Should I Buy A Vehicle Rooftop Tent? If you’re an avid camper that’s always on the go, moving from campsite to campsite, a rooftop tent could be your best investment. It will not only save you time but will allow you to get to the important part of your trip and that’s enjoying the actual camping! With a rooftop tent, there’s no need to spend time clearing a camp site or sorting through poles and pegs. 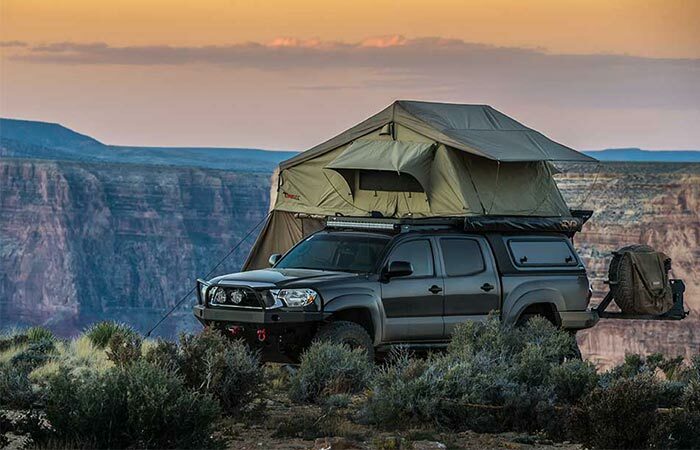 All you really need is strong and sturdy roof equipment with crossbars, such as the Yakima System, where you can attach your tent to your vehicle’s roof and you’ll be sent to go. Classic rooftop tent: Opens like a book. These roof tents have a heavy canvas body, solid base plate, two hinged, typically made from plywood. Pop-ups: Normally made of fiberglass. Hard top and bottom section pop up. Canvas body walls are made of high performance materials. These tents are limited to the size of the width of the vehicle. Normally when putting together a buyer’s guide on any product we would take you through the list of features of the item and point out what exactly to look for. The one thing you won’t have to worry about too much when buying a rooftop tent is whether it is of quality and durability. These tents are built to last and are able to withstand a heck of a lot which is why, what you’ll need to do in order to pick the best one for you, is focus on what your needs are first rather than what features the tent has. Ask yourself the following before starting your search. How many people will I need to accommodate? What vehicle will I be using to transport and erect the tent? Do I want the option to add annexes? How much time am I willing to put towards set up? What are the conditions I will be camping in i.e. Warm environments, rainy, or cold. First and foremost, don’t waste your time looking into tents that only accommodate 2 when you need space for 4. If you’re looking for tents that accommodate less, make sure they have the option to add annexes. Additional annexes with offer you that space needed for extra guests. Also, there is no point in considering buying a rooftop tent that won’t actually fit on your roof rack. Planning on moving to a new site every few days or will you be settling in one for more time? 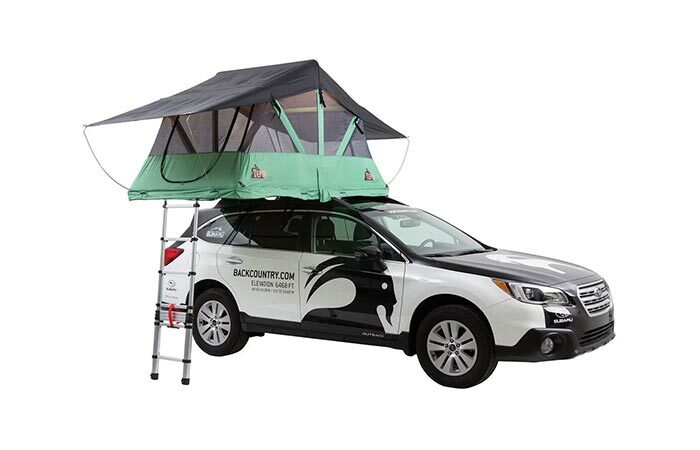 If you’re on the go often, you’ll want to look for a vehicle rooftop tent that sets up and disassembles rapidly. If you plan to camp in areas with more varied weather conditions, you will want to consider investing in a tent made of the highest quality materials. Your tent should hold up against extreme weather conditions if this is the environment you plan on being in. 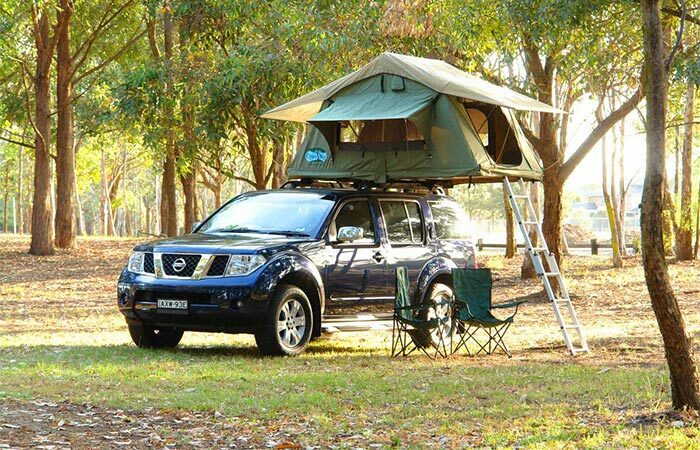 Vehicle rooftop tents can range anywhere from a few hundred dollars up to $3,000 if not more. You’ll want to ask yourself how often and for what length of trips you plan on using your tent. If you don’t plan on using it so much then we wouldn’t suggest going out and dropping a few grand on the most luxurious model out there. With a product like this, it’s best to decide first, before setting your budget, when and how often you plan to use the tent. 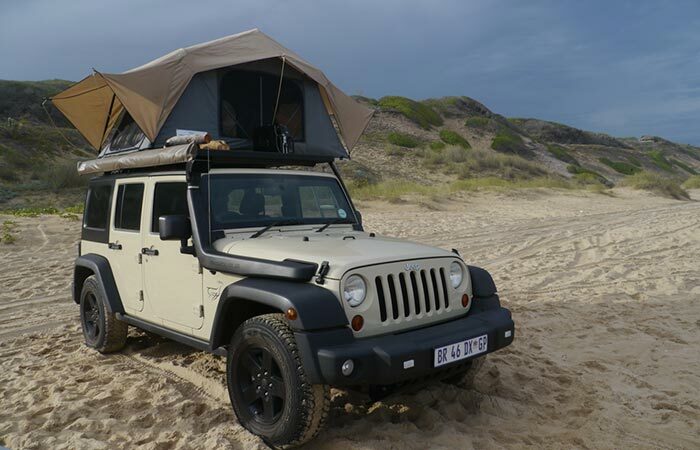 No matter what your situation is, we’ve come up with a list of the best vehicle rooftop tents for your needs. Whether you require space for a family, are looking for the best value, or are wanting a tent that fits on your jeep or mini, you’ll be sure to find it here! Assemble in 5 and take down in 15, and no we aren’t speaking in minutes, that’s seconds! Depending on weather conditions such as heat, cold, and wind, this hard shell roof tent made of fiberglass fortified polyester, will automatically set up in 30 seconds or less. Setting up and disassembling your vehicle rooftop tent has never been so easy as with the automatic system of The Evasion. At 40” high and with a 55W/78L, they’ll be enough space in The Evasion for 2 -3 adults. For the most lightweight vehicle rooftop tent on the market, take a look at the Feather-lite, weighing in at only 93 pounds and measuring 1.3 m wide by 2.4 m high; this tent can comfortably sleep two people, has storage for bedding, and comes with both privacy panels and mosquito netting options. Made out of a poly-cotton material, and with an insulated aluminium base, the tent is water resistant and water durable. The best way to mount this lightweight to the top of your vehicle is with the FrontRunner Slimline 11 Roof Rack. – Two mounting options : Positioned on the top and off to the side OR Fully on top with the ladder coming off the back of the vehicle. If capacity is your focus, then this is the perfect family tent; sleeps 3 adults comfortably or 2 adults and 2 children. Measuring 56” W x 96” L x 52” H, not only can the Kukenam accommodate but it can also be trusted. As the toughest tent by Tepui, you can have confidence knowing that it’s solid build will be able to hold up in varied weather conditions. Best for use on 4 x 4 or off road vehicles. – Dual rainfly rods: Offer extra support in high winds. – Durable: Ripstop fabric on the body and raw aluminum diamond plate base panels. CTV has created one of the best value 2 person roof tents around. Years after its release, this model continues to hold its place in the market of best value rooftop tents. The name of the tent, Mt. Bachelor may be slightly deceiving because in fact this vehicle rooftop tent can definitely accommodate more than 2 people comfortably if needed. Weighing 120 lbs and measuring 56” W x 96′ L x 50” H, space is clearly not an issue in this camping shelter. – Protective: The canvas blend fabric with poly-cotton ripstop makes the tent durable and resistant to weather conditions. 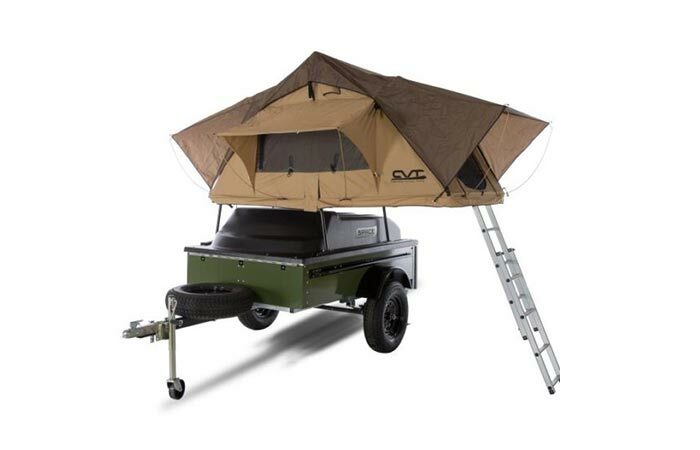 The key to this vehicle rooftop tent is its versatility and ability to adapt to all seasons. With interchanging canopies, purchased separately, which can be attached with a zipper gimp, you’ll find that you’ll always have the right cover no matter the conditions. The Baja Kukenam Mesh 3 accommodates 3 people, measures 56”W x 96” L x 52” H and weights only 108 lbs. –Interchanging Canopies: Choose the mesh canvas for those warm and dry days, the aluminized canopy for cold conditions, and the ultralight ripstop nylon for multi-use. 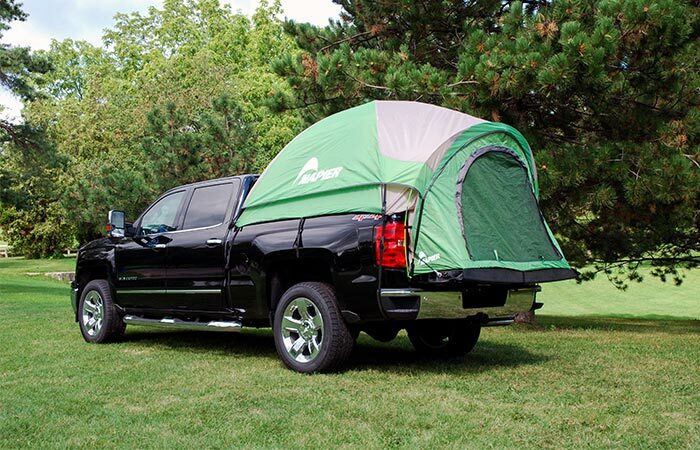 This truck tent falls into a category of its own and although it’s not technically a vehicle rooftop tent, based on our previous descriptions, we have included it as a more economical option to try before you commit fully to the big boys of vehicle rooftop tents. The Backroadz assembles in an open bed pick up truck to a height of 68” and can accommodate 2 people. A folding tent you can count on and one that is a combination of comfort and convenience! Do you own a Jeep Wrangler or similar and are consistently finding yourself wanting to make camp in not so ideal locations, aka sites with uneven ground for example? 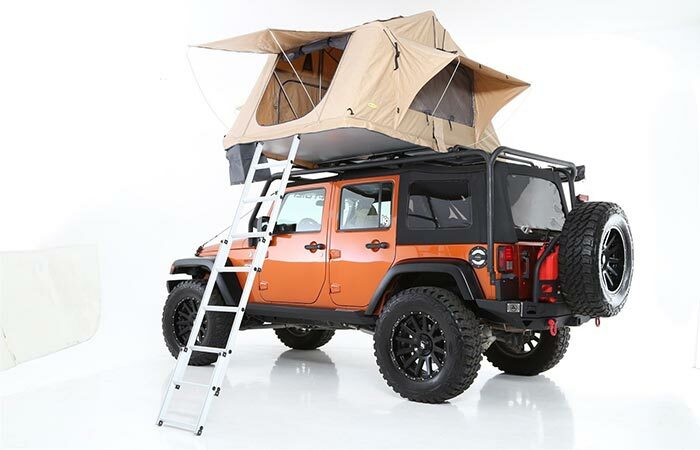 This very well may be the best vehicle rooftop tent on the market for you. With a 2 person capacity; you’ll find that this roof tent is also lightweight, at only 50 lbs, and measures 95” W x 56” L x 51 H. Able to hold 660 lbs and tough enough to stand up to wear and tear, if you’re looking for a tent that won’t let you down, you’ve just found it. – Self Contained: Space saver when folded; all accessories fit inside and can be folded up for easy storage. Smittybilt has a great range of other products too; check out their Amphibious Winch, Folding Shovel, and Tactical G.E.A.R Seat Covers. Let’s close up camp on the topic of the rooftop tents. There’s no denying that a rooftop tent may be the way to go if you’re looking to add convenience to your next outdoor outing. When you decide to take the step to modernize your camping experience, we’re confident that by investing in a vehicle rooftop tent you’ll be making a purchase decision that you’ll be extremely satisfied with. Remember, there are a few important things to keep in mind when you’re searching for the best rooftop tent. We highly recommend starting by figuring out your specific needs. Ask yourself the questions listed under the section ‘Considerations Before Buying’ in the first half of this post. We are confident that once you’re able to clearly understand your needs, you’ll have a better idea of which tent will suit you best. For anyone out there looking for a rooftop tent they can mount on their mini, take a look HERE.